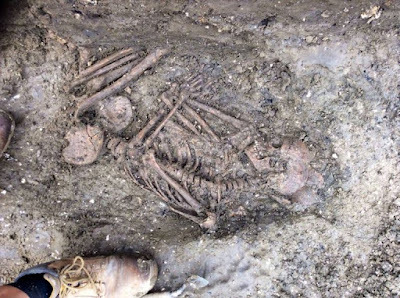 A 4,000-year-old Bronze Age skeleton of a child has been discovered in the foetal position near Stonehenge. The kid, found wearing an amber necklace, was unearthed by a team from the University of Reading, who are excavating Wilsford henge in the Vale of Pewsey, Wiltshire. 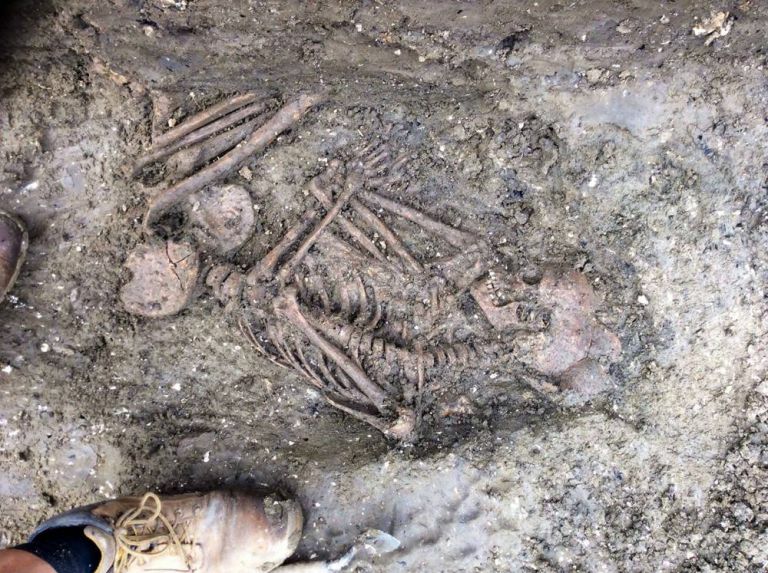 It is believed the skeleton will help shed light on the lives of those who lived and worshipped at nearby Stonehenge. Efforts will now be made to determine the age and gender of the child and where they were from after the find was made on Tuesday. The Vale of Pewsey, situated between Stonehenge and Avebury, is the subject of a three-year dig but over the last six weeks, archaeologists have focused on Marden henge and Wilsford henge. Built in 2400 BC, Marden henge is the largest henge – a prehistoric monument – in the country. Dr Jim Leary, from the University of Reading’s department of archaeology, described the skeleton as a ‘wonderful discovery’. He said: ‘Finds from the first five weeks of the dig were exciting – but as so often during excavations the best is revealed last. The skeleton is a wonderful discovery which will help tell us what life was like for those who lived under the shadow of Stonehenge at a time of frenzied activity.